Here is a demo usage of how the Knowledge Engine can be used to allow exploratory and collaborative learning for a group. 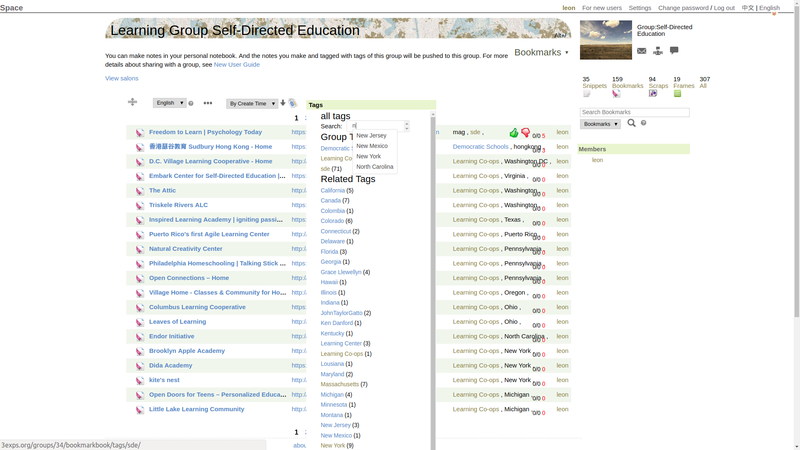 I set up a group named Self-Directed Education, and all resources collected with the official tags of the group (currently: sde, Democratic Schools, Learning Co-ops) by its members are pushed directly to this group. Then these resources can be viewed through tags or queries like above. As this screenshot shows, you can view by official tags, or other related tags. Search function is provided. So it is easy to search resources within a location, for example. This entry was posted in 使用示例. Bookmark the permalink.